Great card. Love the bright colours, the paper is fab. Gorgeous card sweetie love the spring colours & the image of course. Hi Laney this is a real beauty the papers, colours and Tilda look terrific. Eine ganz ganz wundervolle Karte. Vielen lieben Dank für deine Teilnahme an der Stempelsonnenchallenge. 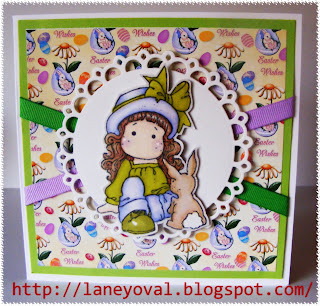 A gorgeous card Laney, lovely colours! Laney, just to let you know I finally posted you a little something from your top3 place at CD Sunday for Wings N Legs, it may take a few days to arrive as I am in France, I usually put a little notelet in with it, but didn't manage it this time as I have been quite ill with Pluerisy the past couple of weeks. Love your beautiful bright Easter card. Thnaks for joining us at stempelsonnenchallenge. Fantastic, a wonderful easter card, love this Image! Thanks for joining us at Stempelsonnenchallenge! Awww this is so gorgeous love fresh spring colour combo sweet Tilda creation. Fab card, I love those bright colours.